Replace lawn with something useful (of course leaving lawn for the family to play IS useful. I would say though that most lawns do not get used except to serve as something green infront of the house. It can be replaced with other green things that do not require so many energy, poisonous, and maintenence inputs!!! With these in mind I decided to put in a raspberry and strawberry bed at the side of the house this summer. Not only did I want to have berries, but I wanted them to be located in front of a weeping mulberry tree in which the kids like to play and eat the mulberries. I thought it would be fun for them to have berry patch that produces foods at different times throught the season so that they can snack all summer long and into the fall (Permaculture principles: Dispersal of yield over time and Diversify). In the picture below we see the Mulberry tree in the background and the bed in which I have already planted a couple of Heritage everbearing raspberry. 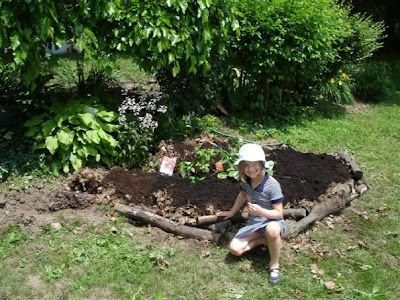 A layer of leaves is put over the bed to add some humus to the soil as they break down and are eaten by worms. They will also retain moisture and smother weeds. 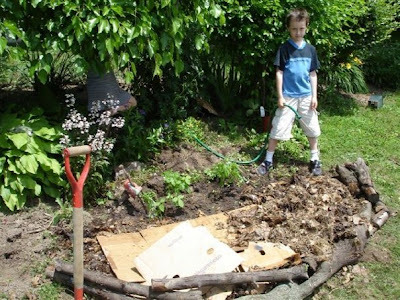 The leaves were saved from the previous fall (Permaculture principles: Use biological resources, Use onsite resources, Produce no waste (i.e., throwing the leaves out). 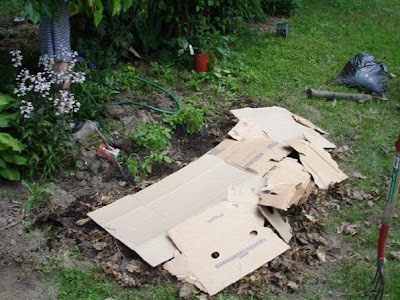 A layer of cardboard ensures that no weeds will come through (Permaculture principles: Appropriate technology (no roundup required! ), Use onsite resources). 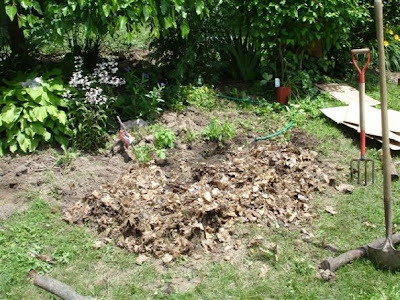 Another layer of leaves (Permaculture principle: Observation, layering the leaves in what will be here after a no-dig bed models natural systems where organics decompose on top of the soil and are incorporated into the underlying soil by natural processes including bugs and worms). Each layer has been watered. A border of logs is placed around the bed. They are from branches that I cut down to let some more sun into the yard. I am trying not to "export" any materials from the site. That means that I am not using the city's green recycling program but instead reusing the materials in my own yard (Use onsite resources). A layer of soil tops off the leaves and the Veestar strawberries are planted. The runners should root this summer so that we will have an early summer crop next year. White clover is all sown as it fixes nitrogen, which will naturally fertilize the plants, and will displace weeds. 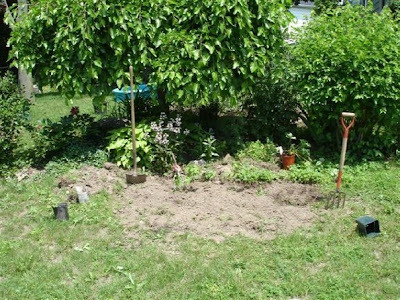 The interplanting of raspberries, strawberries, and clover demonstrate the permaculture principle of Stacking or Layers, where plants with different heights and root depths are planted in the same physical space. I've listed a few of the key permaculture design principles that were used in creating the raspberry and strawberry bed throughout the blog, although I am sure that several more would apply. It does give and idea of how permaculturalists think. See if you can apply any of them to your yard. Also, if you have them, try to get your kids involved too. They usually like to help and it is great to let them learn about how food is produced. To finish, the bed really took off and is now covered with strawberry runners. I am expecting a good crop next spring. The raspberry plant also produced raspberries in both the summer and fall. My daughter loved being able to go out and eat them. While I forgot to get a shot of the established bed, I'll leave you with one from the other side of the mulberry tree . As you can see, this little patch will be a guaranteed play spot for years to come. Looks good Paul. This inspires me to document some of the things I do in my own backyard. Great! I would love to see what you are doing! Thanks for all the tips! We just planted raspberries along the back fence. I love your blog - please post an update about how things are progressing. We're going to try strawberries and clover. We've also read that garlic is a good companion and helps keep away the pests. For fun I've also tried planting some sugar snap pees...we'll see how that goes! I've got a blog in the works...I'll have to post a link to the raspberry permaculture experiment when I do that. I'm also looking into creating an "apple guild" for my apple tree. Permaculture is awesome! Thanks for the great pics and recommendations!